[시사뷰타임즈] 미국과 중국 사이의 무역 다툼이 두 경제 대국이 서로에게 아직도 가장 큰 부담이 관세 문제를 월요일 터뜨리면서 더 심해졌다. 트럼프 행정부는 동부 표준시각으로 자정을 기해 중국 상품 2000억 달어어치에 새롭게 관세 10%를 부과했는데 이는 음식 양념, 야구 장갑, 인터넷 라우터 및 산업기계 부품들을 포함하여 범위를 넓힌 것이다. 중국은 즉각 고기, 화학제품 옷 및 자동차 부품들에 대해 보복적으로 5~10%의 관세를 추가로 부과했다. “우린 ”더 나아지기에 앞서 최악의 상태인“ 국면 한가운데 정면으로 처하고 있다고 BNY 멜런 투자관리 회사의 고위 주권 분석자인 아닌다 미트러가 지난 주 가장 최근 관셰가 있은 뒤 쪽지로 말을 했다. 대통령 도널드 트럼프의 중국에 대한 관세 파장은 이제 중국 상품 2500억 달러어치에 달하게 됐는데 이는 중국이 미국에 수출하는 상품의 대략 절반 정도에 해당되는 것이다. 이번에 관세가 부과된 것들은 미국 소비자들이 구매하는 수천가지의 상품인데 가구 및 전자 제품들이 수백 가지 들어있다. 올해 미국이 관세를 부과한 상품은 대체적으로 공산품들이다. 이러한 조치들은 지적재산권 도적질 등 불공정한 무역관행에 대한 응징적인 것을 뜻한다는 것이 트럼프 행정부의 말이다. 베이징은 미국의 주장을 거부하면서 보호주의로 괴롭히는 것이라며 미국을 비난하고 있다. 중국은 이에 대한 반발로 미국 제품 1100억 달어 어치에 이상에 대해 관세를 부과했다. 중국 관영 신화통신에 따르면, 중국은 월요일 발표된 두 나라의 무역 관계에 대한 장문의 백서에서 트럼프 행정부가 “그릇된 비난”을 하면서 극단적인 압력을 통해 미국이 취할 이자를 붙이고 있는 것이라고 했다고 보도했다. 가장 최근 미국의 태세를 보면 금년 년말까지 10~25%로 관세를 올릴 준비가 돼있다. 중국은 아직 어떻게 대응하겠다는 말은 없다. 미국에서 자국의 수출액보다 훨씬 덜 수입을 하는 중국은 보복 관세를 매길 품목이 바닥나고 있는 중이지만 분석자들은 중국에게 또 따른 방식의 보복 방법이 남이있다고 말한다. 이런 것들에 해당되는 것으로는 훨씬 더 높은 관세를 매기거나, 수입할당제를 부과하거나 중국인들이 미국에 여행이나 공부하러가는 것을 제한하거나 관세로 영향을 받는 회사들 세금을 대폭 깎아주는 게 그것이다. 트럼프 행정부 관계자는 궁극적 목표는 관세가 전혀 없이 자유무역을 하고 양측에 보조금도 없게 하는 것이라고 말했다. 그러나 분석자들은 베이징이 미국의 의도를 더욱 의심하고 있다고 말한다. 베이징의 코빙튼 & 벌링 변호사 사무실의 관리 기획자인 티모시 스트해포드는 지난 주 “미국의 동기부여가 현재 중국을 주저 앉히며 제한하는게 되는 것이라는 우려가 점점 더 커지고 있다”면서 “얼마 후 교착상태가 될 것으로 예상한다”고 했다. 최근의 관세 상황으로 신속히 앞으로 나아가겠다는 트럼프의 결정은 미국과 중국 양측의 새로운 대결의 장을 위한 계획에 제동을 건 것처럼 보인다. 재무부 장관 스티븐 엠누치는 중국인 협상자들을 워싱튼으로 초청하여 대화를 재개했지만, 금요일, 백악관 고위 관계자는 당분간 새로이 만날 계획은 전혀 없다고 했다. 많은 미국 기업 사장들은 중국의 무역관행 문제가 처리돼야한다는데 동의하지만, 수입을 하는 회사들이 부담해야 하는 관세를 부과하는 것에 대해선 반대한다. 최고경영자들은 현재 비용을 흡수할 것인지 아니면 소비자들에게 전가시킬 것인지를 결정해야 한다. 일부 사장들은 중국 이외의 나라를 수입처로 찾을 수도 있겠지만, 이런 건 시간이 걸린다. 수천 곳의 회사들이 정부에게 모종의 상품들은 관세부과 목록에서 제외해 달라고 요청하면서 자신들이 필요로 하는 품목들을 중국 이외의 나랑서 찾을 수가 없다고 주장했다. 기업들의 이러한 요청이 지금까지 받아들여진 건 없다. 거대 기업들은 이미 손실에 대해 경고하고 있다. 미국의 칩 제조사 마이크론은 목요일, 미국의 새로운 관세 파장이 미국의 이익을 앞으로 해칠 가능성이 있다고 말했다. 중국의 관세는 액화 천연 개스를 풍부히 팔 계획을 잡고 있는 미국의 에너지 회사들을 다치게 할 것이다. 미국 소비자들은 다양한 가재도구들 즉 샴푸, 개 사료 및 가전제품들의 가격이 늦가을 쯤에 오르는 것을 볼 가능성이 있다고 베이커 도넬슨 변호사 사무실의 세계 사업부 팀 공동 팀장인 도린 이델만이 말했다. 월마트는 관세 때문에 다양한 품목들의 관세를 도리없이 올려야 할 것이고 말했고 타겟은 일을 하는 가족들이 공책, 계산기 및 바인더 등과 같은 수업 필수품에 돈을 더 쓰게 될 것이라고 했다. 프락터 & 갬블도 관세가 자사의 가재 도ㅜ인 스테이플의 가격을 올리게 할 것이라고 했다. 중국 기업들도 영향을 받는다고 느끼고 있다. 휑 벤하오는 달리안에 있는 자신이 운영하는 무역회사가 엄청난 충격을 받고 고통을 겪어오고 있다고 했다. 이 회사는 20년 이상 동안 미국 회사들에게서 수산물을 구입해오고 있는 중이다. 그러나 지난 7월 중국 정부가 미국에서 들어오는 수산물에 25% 관세를 부과하면서, 미국 공급사를 버리고 캐나다 및 유럽 등의 나라로 거래처를 돌릴 수밖에 없었다고 휑은 말한다. 휑은 CNN에 “무역전쟁이 곧 끝나길 바란다”고 했다. 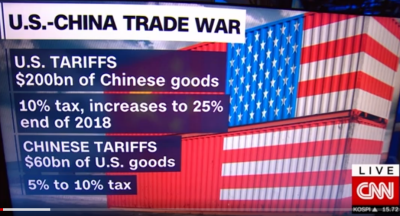 (CNN)The trade fight between the United States and China intensified Monday as the two economic superpowers hit each other with their biggest round of tariffs yet. The Trump administration imposed new 10% tariffs on $200 billion of Chinese goods just after midnight ET (noon in Beijing), spanning thousands of products, including food seasonings, baseball gloves, network routers and industrial machinery parts. China retaliated immediately with new taxes of 5% to 10% on $60 billion of US goods such as meat, chemicals, clothes and auto parts. "We are squarely in the midst of the 'it'll get worse before it gets better' phase," Aninda Mitra, senior sovereign analyst at BNY Mellon Investment Management, said in a note after the latest tariffs were announced last week. President Donald Trump's waves of new tariffs on China now apply to over $250 billion of Chinese goods, roughly half the amount the country sells to the United States. The latest round affects thousands of products bought by US consumers, including hundreds of millions of dollars of furniture and electronics imports. The US tariffs imposed earlier in the year mostly hit industrial goods. The measures are meant to punish China for what the Trump administration says are unfair trade practices, such as intellectual property theft. Beijing has rejected the US assertions, accusing the United States of protectionism and bullying. It has fired back with tariffs on American goods worth more than $110 billion. The Trump administration has made "false accusations" and sought to "impose its own interests on China through extreme pressure," the Chinese government said in a lengthy white paper published Monday about the two countries' trade relationship, according to state news agency Xinhua. Further escalation is already looming. The latest round of US tariffs is set to increase at the end of the year from 10% to 25%. China hasn't yet spelled out how it will respond to that. Trump has also threatened tariffs on another $267 billion of Chinese products. That would mean the US measures effectively cover all China's annual goods exports to the United States (the total for 2017 was about $506 billion). China, which imports a far smaller amount from the United States, is running out of new products to target, but analysts say it still has other options to retaliate. They include charging even higher tariffs, imposing import quotas, restricting Chinese citizens' travel to the United States for study and tourism, and slashing taxes for companies affected by the tariffs. Trump administration officials have said that the ultimate goal is to achieve free trade with zero tariffs and zero subsidies on both sides. But analysts say Beijing is becoming more suspicious about US intentions. "China is growing concerned that the US motivation is now trying to keep China down and contain it," Timothy Stratford, a managing partner at law firm Covington & Burling in Beijing, said last week. "I expect that we're going to have a deadlock for some time." Trump's decision to move ahead rapidly with the latest tariffs appears to have put the brakes on plans for a new round of negotiations between the two sides. Treasury Secretary Steven Mnuchin had invited Chinese negotiators to Washington to resume talks, but a senior White House official said Friday that no new meetings are planned for the time being. Many American business leaders agree that China's trade practices must be addressed, but they object to the use of tariffs, which are paid by companies importing the products. CEOs now have to decide whether to absorb the cost or pass it on to consumers. Some may be able to find a new supplier outside of China, but that takes time. Thousands of companies have asked the government to exclude certain products from the tariff list, claiming they cannot find another supplier outside of China for the items they need. None of their requests have been granted so far. Big corporations are already warning about the damage. US chipmaker Micron said Thursday that the new wave of US tariffs is likely to hurt its profits in the coming year. China's tariffs could hurt America's energy companies planning to export an abundance liquefied natural gas. American consumers are likely to see prices rise later this fall for a variety of household products, ranging from shampoo, to dog food and appliances, said Doreen Edelman, co-chair of the global business team at law firm Baker Donelson. Walmart has said the new tariffs could force them to raise prices on wide variety of items, and Target said working families will pay more for school essentials like notebooks, calculators and binders. Procter & Gamble has also warned that tariffs could raise the cost of many of its household staples. Chinese businesses are feeling the effects, too. Feng Renhao said his trading firm in the northeastern city of Dalian has suffered "a huge impact." It had been buying seafood from American companies for more than 20 years. But after China slapped 25% tariffs on seafood from the United States in July, Feng said he had to drop his US suppliers and turn to Canada and European countries. "We hope the trade war can end soon," he told CNN. 靑 조동호, 최정호 2명 지명 철회로 충분할까? 지난해 8월 드론 이용 마두로 암살 계획, 베네수엘라 자작극?